Most Mainers mark the arrival of spring with the harvesting of fiddleheads. Let me be the one to say, ew. No thanks. This is not your blog. But, if you’re looking for bitter stalks of ruby red to delight your senses, well we are your family. 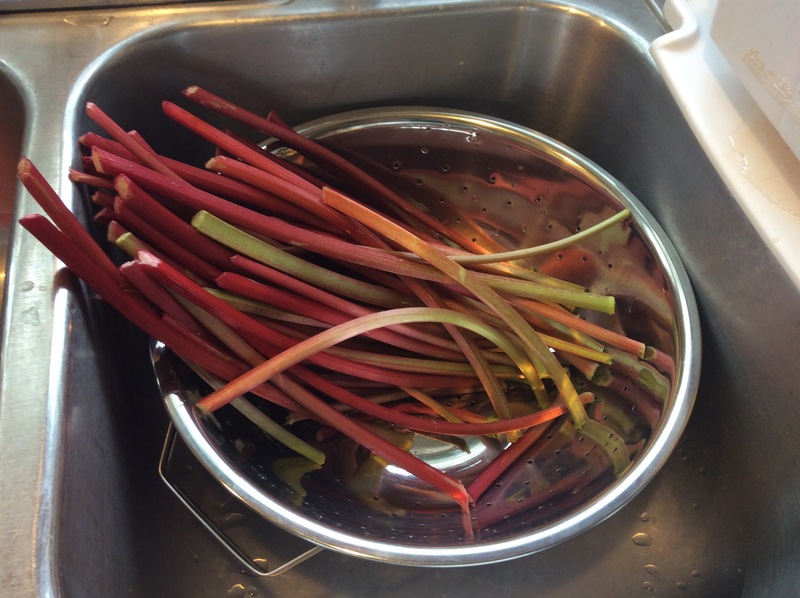 Now, rhubarb is an herbaceous perennial, meaning once you get a plant going, and you treat it right, which is actually very little interference, it will come back year after year. It’s stalks and leaves come first, and can get quite large. 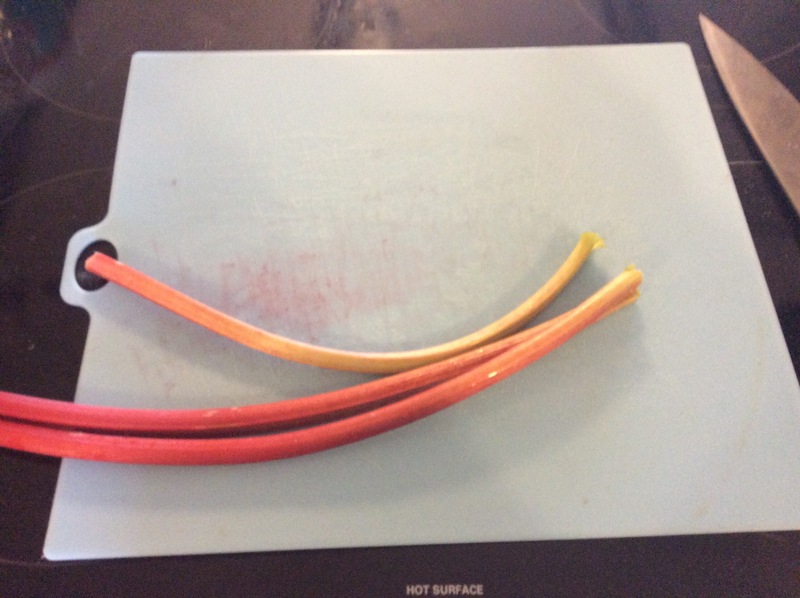 These preface a flower that once comes in, means the end of rhubarb season. It’s short and you have to get to it to catch it, but it is so worth it. A lot of old homesteads have rhubarb plants that have survived even after the family is gone. We go to two different places in search for the stalks. Yesterday, we took a walk to a property owned by my husband’s uncle. There is a row of several plants, each one slightly smaller then the last. The biggest one at the beginning of the line had already started its flower. And someone had already raided the patch a little, but we like the thinner stalks anyway, so I grabbed my shears and started snipping away. It’s important to note, some people do the grab and twist method- basically you pinch the stalk between your pointer finger and thumb, digging a little into the ground with your fingertips. Then, very simply, twist and pull. You cut the stalk down close to the ground. Go ahead and snip the leaf off as well, since those are POISONOUS AND SHOULD NOT BE EATEN EVER. Ehem. Just to be completely clear- do not ever under any circumstances eat the leaves of the rhubarb plant. Also, it’s important to Not over harvest..please do not cut to much of the plant. This plant requires very little care, but when foraging a perennial it is super important to harvest responsibly so you can enjoy for years to come. At the end of the season, you can go back and clip everything down. We don’t, as they aren’t our plants and we wouldn’t want to chance destroying them. Now, the best way to preserve rhubarb for when you actually use it (hello strawberry season!) is to cut it up and freeze it. Give it a quick rinse in a colander, then let it air dry for a few hours. You could hand dry it with towels, but I have a lot to do and they are fine hanging out. Yes I am using my stove top as a countertop. No it is not a hot surface at this moment. 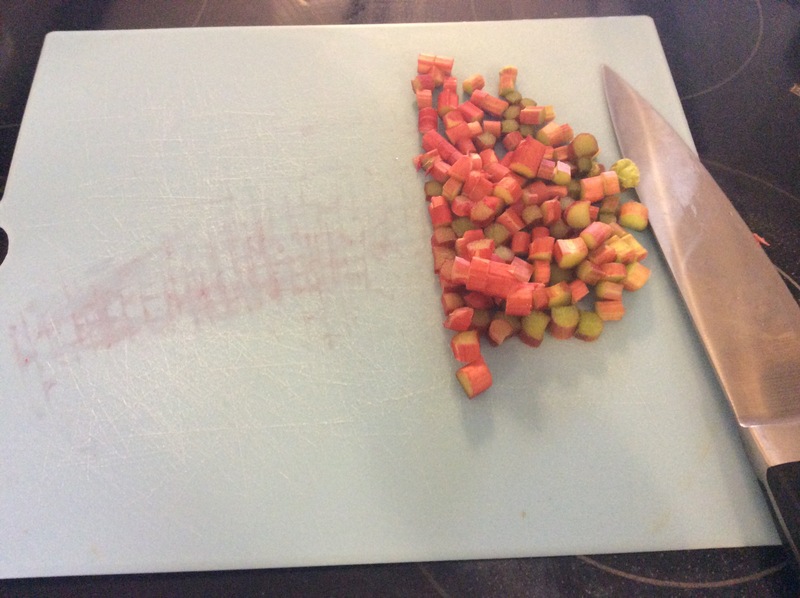 Next cut it up into uniform chunks- also not that important. They freeze and thaw more evenly, but when making jam, you end up boiling it to mush anyway. Tadaa! Now we bag it with our handy dandy food saver and stash it in the deep freezer until early July when the berries come in. Yea! Spring! Amazingness and free food and such! Next blog is about our upcoming yard sale, how we prepped for it and if it was worth it. It’s a work in progress for sure. Until that day, have a wicked good time. Next Post SELL ALL THE THINGS!